Thanksgiving is just a few weeks away. And while normal folks are beginning to stress that this year’s turkey will again resemble something on the autopsy table in an episode of CSI, or on the whereabouts of the good china, the seating arrangement, side dishes, or the inevitable family drama that unfolds as reliably as winter follows fall, you and I are laser focused on the one piece of the feast that really matters: our beloved pies. Which ones shall we serve? How many? At what temperature? On which dessert plates? Whipped cream, ice cream, or both? Over thinking these things is second nature to us, an undeniable piece of our culinary DNA. I belong to an even more exclusive subset of Thanksgiving pie extremists, and if you count yourself among us please be brave and step forward: those who suffer from pecan pie perplexia. 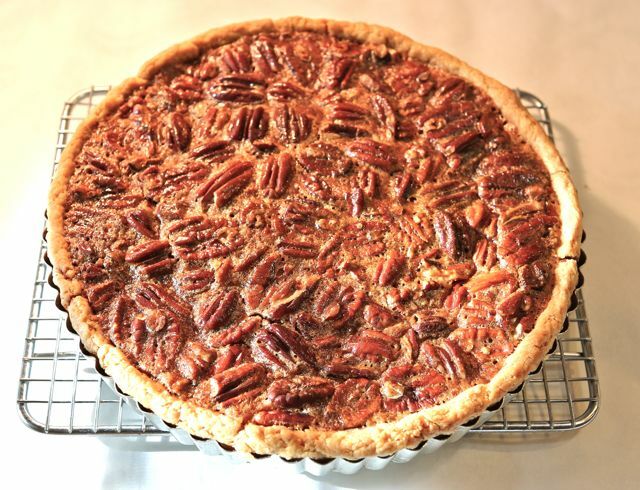 Pecan pie perplexia is a condition characterized by concerns that seem micro to most but paramount to us: should we toast the pecans first, before they go into the pie, or will they toast inside the pie as it bakes? Do I have to prebake the shell? Chop the nuts or leave them whole? And – perhaps the most anxiety inducing question of them all – how can we cut the blessed thing without crushing the slices and squirting soft filling hither and yon, an ignominious finale, if ever there was one, to the most important course of the most important meal of the year. Well pay attention my pie loving friend, because I’m about to divulge the answers to these pecan pie conundrums and lay them to rest once and for all. Let me begin with this finding: the perfect Thanksgiving pecan pie turns out to be not a pie by appearances, but rather a pie disguised as a tart. Let me explain. Look at the photos here; there is no filling squirted hither or yon. Indeed, you see precision cuts. If the Marine Corps taught pecan pie slicing, this is how it would look. Why is there no squish, especially in light of the fact that you see lots of pecan halves? (Big pieces of pecans = more filling squish.) Answer: because I par-froze the tart before slicing it with a long, sharp, serrated bread knife. I held the knife parallel to the top and began sawing my way down through. 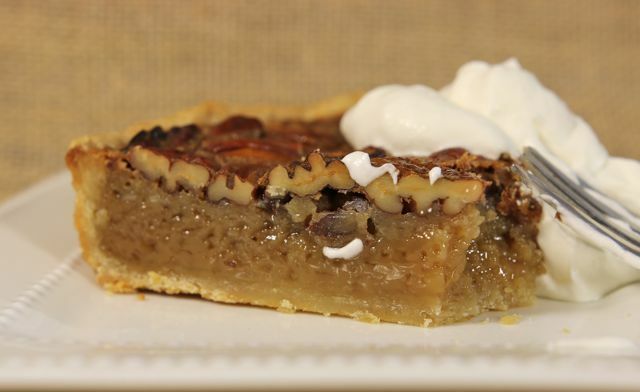 Because the pecan topping and filling were semi-frozen – and by that I mean the tart went from thoroughly refrigerator-cold to the freezer for about 75 to 90 minutes before slicing – the knife cut cleanly through the tart. Entire pean halves are essential for maintaining your pie cred; mere pieces raise silent concerns that you’re hiding lesser nuts in the mix. Naturally, you can’t do this if you’ve baked your pie in a pie pan; the sides of the pan don’t allow it. So instead of a pie pan, I bake the pie/tart in a 9 1/2-inch tart pan with a removable bottom and then remove the tart from the pan before slicing it. I think pecan pie tastes best only slightly chilled, so I leave the slices on the removable bottom, in the fridge, until about an hour before serving. Then I let them sit at room temperature until serving. But let’s back up for a moment and tackle some of these other issues, like prebaking the shell. In a word, no, you can’t skip this step. Prebaking assures that you will get a firm, nicely browned and crusted bottom crust. I know a lot of cooks consider this step a hassle, but to me it’s dedication to the pie maker’s craft and the mark of a genuine pie artist. 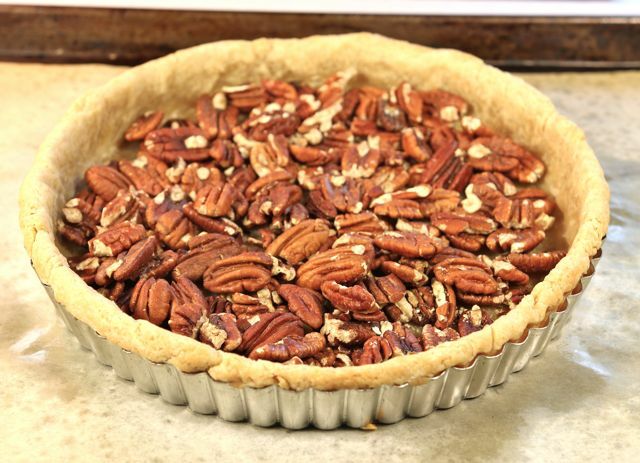 Whenever I see a pecan pie recipe that calls for an unbaked pie shell, I cringe because I know the baker is going to wind up disappointed and, likely, embarrassed to serve a flabby bottomed pie to guests. When the shell comes out of the oven, I’ll toast the pecan halves because lightly toasted pecans have more flavor than untoasted ones, nor will they get properly toasted if you use them raw in the pie. Entire pecan halves are essential for maintaining your pie cred; mere pieces raise silent concerns that you’re hiding lesser nuts in the mix. I just spread them on a baking sheet and put them in a 350° oven for about 5 to 6, maybe 7 minutes, but no more. They can go from just right to over toasted very quickly, so watch them closely. And don’t leave them on the sheet after they come out; immediately dump them on your counter because the residual heat in the pan will continue to toast them. Next, I’ll spread the pecans in the shell, then slowly pour the filling over all of them. 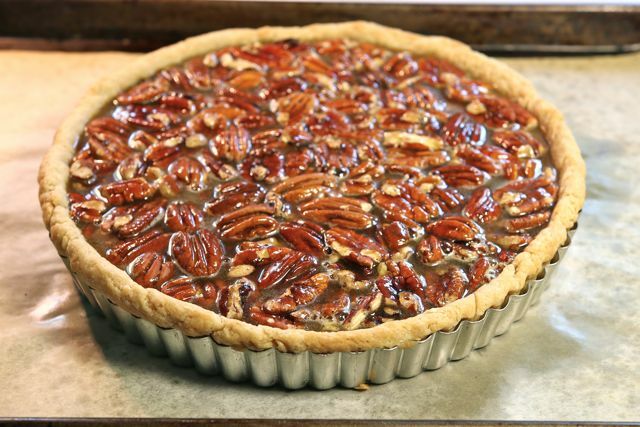 Whether you’re making a pecan pie or a quiche, always add the filling slowly. If you dump it like a tsunami, you’ll displace the solids already in the shell and wind up with an unevenly filled tart. I love my large, spouted Le Creuset batter bowl for this purpose. Even if I haven’t mixed the filling in it, I’ll transfer it over to the spouted bowl before pouring it into my tart. The spout allows for a much more controlled pour. Then into the oven it goes. I’ll start my pecan pie at 350° but I like to turn it down to 325° about halfway through. I don’t like to take any chances, with egg-based pies, that they’ll bake too hot. Excessive heat can cause eggs can “break” and make your pie weepy. Low and slow is better and safer. When is your pecan pie done? There are visual clues, like a slight puffiness. A lot of puff typically means your oven is too hot or you’ve baked the pie too long. Avoid that. 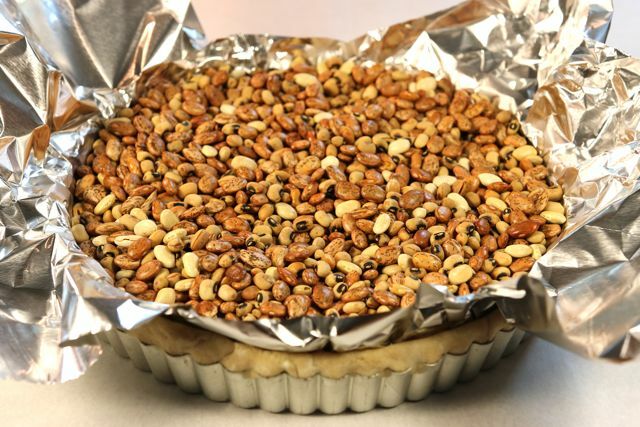 Give the pie a nudge: if you can see the filling roll like a wave beneath the nut topping, it isn’t done and probably needs at least 7 more minutes. If the filling jiggles rather than rolls, it’s done. Transfer the pie to a cooling rack, cool for several hours, then refrigerate overnight before partially freezing it for slicing. Shame on me for not mentioning until now how rapturously delicious this pecan pie is. 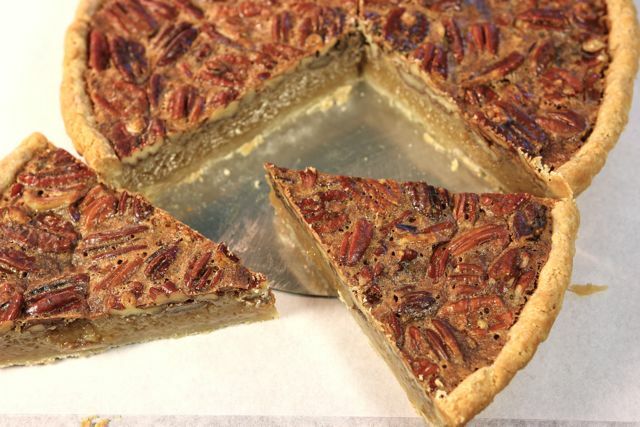 There’s more to pecan pie than just slicing and prebaking the crust – much more, in this case. 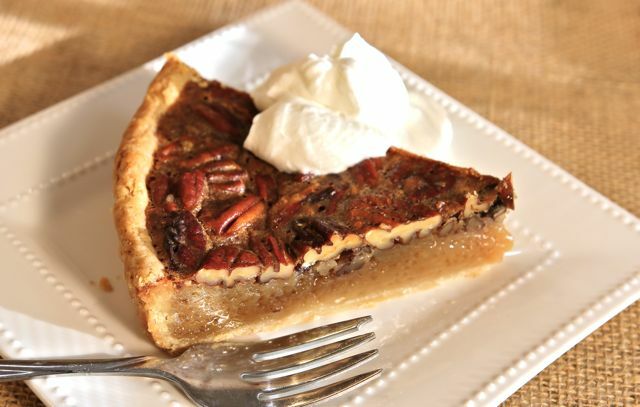 I sometimes call this my North Meets South Pecan Pie because it uses my favorite sweetener from my New England days – maple syrup – and marries it with one of the south’s showcase crops, pecans. Our version is unabashedly rich, sweet, and – like the title says – perfect. Let me know what YOU think, ok? And by the way, rich and sweet as it is, you can easily get 10 to 12 servings out of the pie. A small slice of this decadence is plenty. PASTRY NOTE: In addition to the WHOLE WHEAT PIE DOUGH here, you could also use the GOOD BASIC PIE DOUGH or the FOOD PROCESSOR PIE DOUGH. PREPARE THE PIE DOUGH: Combine the whole wheat pastry flour, all-purpose flour, cornstarch, and salt in a mixing bowl. Refrigerate for 30 minutes. Cut the butter - or butter and shortening - into 1/2-inch cubes and place them on a flour-dusted plate. (If you're using the shortening, put it in one area by itself.) Refrigerate the fat for 30 minutes. To prepare the dough in the food processor, add the dry mixture to the work bowl. Pulse several times, to mix. Scatter about 6 tablespoons of the butter - a little more than half the fat - over the dry mixture. Give the machine five, 1-second pulses then run it nonstop for 5 seconds. Remove the lid and add the rest of the fat. Give the machine six, 1-second pules. Remove the lid, drizzle on half of the water, and pulse 3 times. Drizzle on the remaining water and pulse again, just until the mixture forms coarse, clumpy crumbs. Don't let the mixture form large clods or ball up. Empty the crumbs into a large bowl. Rub them between your fingers to form larger, packable clumps. Pack the dough together, like a snowball, then knead gently - 3 or 4 times - on a lightly floured surface. Flatten into a 1-inch thick disk. Wrap snugly in plastic wrap and refrigerate for at least 2 hours. Alternate method: To prepare the dough by hand, chill ingredients as above. Add about 6 tablespoons butter to the dry mixture. Toss to coat, then cut in the fat with a pastry blender, leaving pea size pieces of fat. Add the remaining fat, toss to coat, and cut that in also. Drizzle half of the water over the mixture; mix well with a large fork, to moisten. Add the remaining water and mix again, until everything is lightly dampened. Add additional water, if needed, by the teaspoon. Rub, pack, flatten, wrap, and refrigerate as above. On a floured surface, roll the dough into a 13-inch circle and line a 9 1/2-inch removable bottom tart pan - or a regular pie pan - with it. Fold the overhanging edge back and pinch-sculpt it so the dough comes 1/4- to 1/2-inch above the edge of the pan. Refrigerate the shell for at least 1 to 2 hours. Preheat the oven to 375°. Line the chilled shell with foil. Fill with dried beans to weight it down. Put the pan on a baking sheet lined with parchment paper or foil. Place the sheet on the center oven rack and bake for 25 minutes. Turn off the oven, remove the foil and beans, and continue to bake for about 7 minutes with the heat off. If the pastry starts to puff, poke it once or twice with a fork. Transfer to a rack to cool. PREPARE THE FILLING: Preheat the oven to 350°. Spread the pecans on a baking sheet. Place on the center oven rack and toast the pecans for 6 to 8 minutes. Remove them as soon as they turn a shade darker. Dump them off the sheet and onto your counter. Cool, then spread them evenly in your pie or tart shell. Melt the butter in a large saucepan over moderate heat. Add the maple syrup and corn syrup. Heat briefly, then add the brown sugar and heavy cream. Whisk in the flour until incorporated, bringing the liquid to a simmer. Remove from the heat and stir in the vanilla and salt. Set aside and cool for 5 to 10 minutes. Whisk the eggs and yolk in a large bowl. Using a ladle, gradually add the hot liquid to the eggs in a slow stream, whisking as you add it. Slowly ladle or pour the mixture over the nuts, filling the shell almost to the brim. 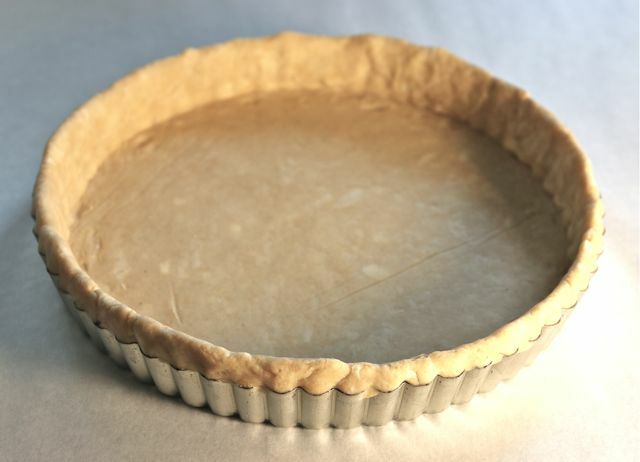 Put the pie/tart on a large, rimmed baking sheet, preferably one lined with parchment or foil. I like to bake this pie with the shelf set one position below center. Bake at 350° for 25 minutes, then lower the heat to 325° and bake another 18 to 22 minutes, until the filling is set. Nudge the pie, to check. It should jiggle as a whole, not move in waves under the nut topping. Transfer to a rack and cool thoroughly. Refrigerate then par-freeze for clean cutting. *Whole wheat pastry flour is milled from soft, low gluten wheat so it makes an excellent choice for pie pastry. You can find it in places like Whole Foods, in health food stores, and the health food sections of many supermarkets.